Keynote-Speakers: Dr. Ken Yeang (Hamzah & Yeang, Malaysia), Emre Arolat (Emre Arolat Architects, Turkey), Jaron Lubin (Safdie Architects, USA), Prof. Herbert Dreiseitl (Ramboll Liveable Cities Lab, Denmark, Germany), Laura Gatti, (Studio Laura Gatti, Italy), Roland Appl (IGRA, Germany), Dr. Deniz Aslan (DS Architecture, Turkey), Tim Flynn (Tim Flynn Architects, United Kingdom), Udo Dagenbach (Glasser & Dagenbach Landscape Architects, Germany), Dr. Heleen Mees (Researcher, Netherlands), and Dr. Hanna Bornholdt (City of Hamburg, Germany). Green Roof installation. In address of this last point, IGRA has developed and recently published a new industry guideline outlining the proper management of transitioning between roofing work and Green Roof installation. The document is titled “Bridging Trades: Safe Section Changeover” and is available for free download at http://www.greenroofworld.com/EN/press.html  and is a helpful tool for anyone involved in the Green Roof industry. 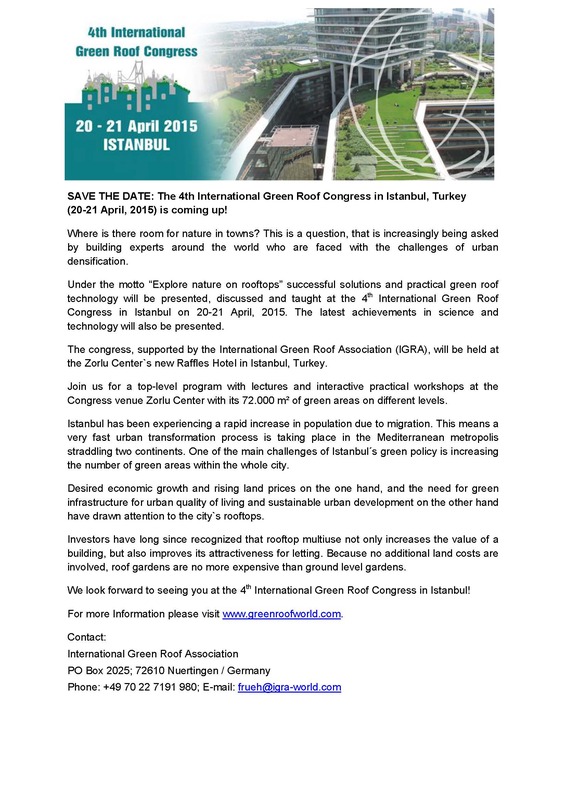 A special discount from the Congress ticket price (Hosts and Supporters) is available. Affiliates can find the required promotion code directly with frueh@igra-world.com.